Five men decide to go on a hunting trip in the backwoods of Arkansas: David (Bottoms), his father Mason (Gulager), Uncle Al (Swofford), their buddy Ralph (Nutter) and die-hard “city boy” and hunting newbie Marty (Travolta). Things seem to be going well, until they run afoul of some murderous “rednecks” who feel these city folk have intruded upon not just their land, but their illegal meat processing operation. So now it’s a deadly game of hide and go seek with David, Mason, Al, Marty and Ralph versus their rural counterparts Snake (Drago) Wash Pot (Jones), Red Beard (De Broux), and Billy Bob (Thornton of all people). When the baddies kidnap David’s girlfriend Melanie (Delaney), it’s an all-out war for survival. Who will come out on top? 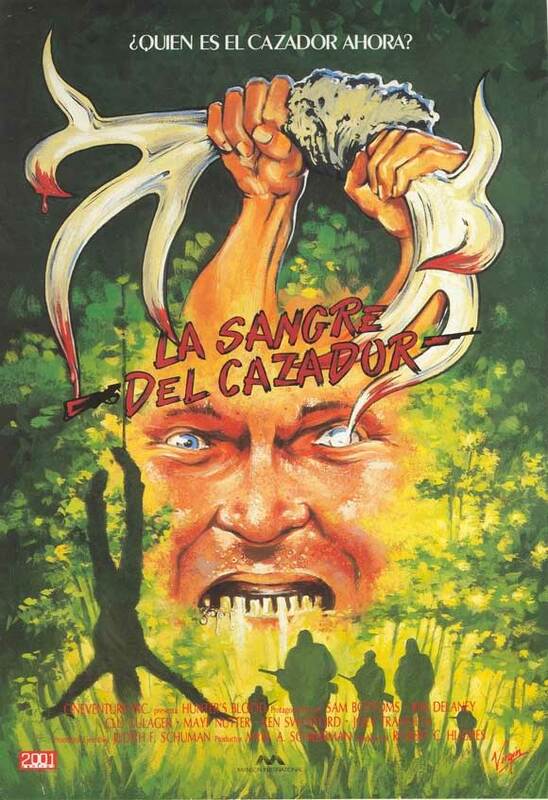 In the 80’s, Deliverance (1972) knockoffs and Wilderness Horror movies were huge in video stores. So it would be the most natural thing in the world to combine them. Hence, Hunter’s Blood was born. It was co-written by the writer/director of 9 Deaths of the Ninja (1985), Emmett Alston, and released in a very bright, clean-looking VHS by Embassy. It would make a nice double feature with Rituals (1977), if you can get a hold of both. When the movie opens, the music on the soundtrack is a guy playing/bending ONE NOTE on the guitar, over and over again. Could this be a sign that the movie itself is a one-note? But then we get to know the protagonists of the piece, the only really likable one being David, portrayed by Sam Bottoms of Ragin’ Cajun (1991) fame. He does a decent enough job, but there are so many characters he doesn’t get enough time to shine. Then the “male bonding” occurs, and it seems like a 90-minute Jack Links commercial, and the fact that all the men sit around a fire and eat a pepperoni stick only reinforces that. There’s a ton of inane potty humor/dialogue, a lot of which underlines the Deliverance-style homosexual nature of the proceedings. In fact, at times Hunter’s Blood seems to aim to out-gay Deliverance. It was the 80’s after all, they probably figured they had to ramp up the gay from the way it was in the 70’s. But once the plot kicks into high gear, there are a lot of nice surprises and worthwhile moments to raise Hunter’s Blood above the pack. And let’s not forget Joey Travolta is on board. A great moment comes when he guilelessly blurts out the line “I love TV!” Not any one particular show, just TV. There are plenty of country tunes that continually appear throughout the film, and the first credit after the movie ends shows this (seemingly a rarity), but the credit only lasts on-screen for about a fraction of a second. But we were able to determine the songs on the soundtrack are by Hamilton, Joe Frank and Weber. We can only assume this is the same group that sang the great song “Don’t Pull Your Love”, but that was Hamilton, Joe Frank and Reynolds. Either Reynolds was replaced by Weber, or, mirroring the “Deliverance knockoff” scenario, there’s a “band knockoff” going on. Either way, no song herein is as good as “Don’t Pull Your Love”. In the end, Hunter’s Blood is solid entertainment, especially if you are a fan of survival-type movies. Eh, as far as Deliverance rip-offs go, "Ain't No Way Back" was more entertaining. Great movie! It deserves a proper dvdrelease! We will take your word for it. We have not seen that yet. 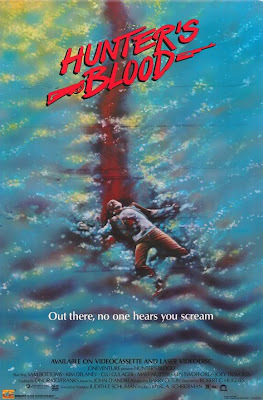 Really liked Hunter's Blood, haven't seen it for a long time, did it ever get a dvd release? Dead Moon Night and A Hero Never Dies: It really should be on DVD! It deserves one...maybe one day. Funny, I just rewatched this last week after reading about it in Carol Clover's book Men, Women and Chainsaws. It is a fun little city-boy romp through the backwoods, and gorier than one would expect. Sounds like a fun read. Happy you enjoyed the movie too! Wow, I saw this one at the thrift store not too long ago but I didn't pick it up. I'm kinda glad I didn't. I mean if Reynolds can't even be bothered to show up then what's the point? I like Hamilton and Joe Frank as much as the next guy, but they're nothing without Reynolds! Thanks for sticking up for Reynolds. We hope your hashtag will help to start righting the wrongs of this national injustice.